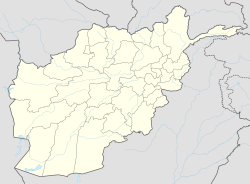 Tāloqān (Persian/Pashto: طالقان, also transcribed Ṫālaqān, Ṫāleqān or Ṫāluqān) is the capital of Takhar Province, in northeastern Afghanistan. It is located in the Taluqan District. The population was estimated as 196,400 in 2006. A coin minted in Taloqan during the reign of ’Ala ed-Din Mohammad ibn Tekesh (1200-1220), the ruler who suffered Genghis Khan's invasion. "a castle called Taikhan, where there is a great corn-market, and the country round is fine and fruitful. The hills that lie to the south of it are large and lofty. They all consist of white salt, extremely hard, with which the people for a distance of thirty days' journey round, come to provide themselves, for it is esteemed the purest that is found in the world. It is so hard, that it can be broken only with great iron hammers. The quantity is so great that all the countries of the earth might be supplied from thence." In 1603, Taloqan ("Talhan") was visited by another European explorer, Bento de Góis, who was traveling with a caravan from Kabul to Yarkand (then the capital of Kashgaria). Taloqan was the last major city to fall to the Taliban, in January 2001, after a siege which claimed the lives of hundreds of civilians. Its capture by the Taliban also triggered a mass exodus in the population, with civilians fleeing towards Imam Sahib and the Panjshir Valley. Irregular Northern Alliance soldiers managed to stop the Taliban advance to the north and to the east of the city, but weren't able to retake it. Taloqan was besieged again in a bloody siege in November 2001 by Northern Alliance soldiers following the United States invasion of Afghanistan. A mass grave containing the bodies of 70 women and children was found, they had been brutally murdered for no reason other than possibly being the families of captured fighters and were ethnic Pashtuns. The testament of the Islamic prophet Muhammad indicates that the city will play a major role regarding the Mahdi. A narration by chain, Imam Baqir states: "Allah Almighty has a treasure in Talaqan which is of neither gold nor silver, but consists of twelve thousand (people), having “Ahmad, Ahmad” for their slogan. They will be led by a young Hashemite man riding a gray mule and wearing a red headband. It is as if I can see him crossing the Euphrates. Should you hear of his coming, rush to him even if you have to crawl over the snow. Another narration states: "Talaqan is a place of treasures of Allah. These treasures are not of gold and silver, but consist of people who have recognised Allah as they should have." Taloqan has a cold semi-arid climate (Köppen climate classification BSk). In winter there is more rainfall than in summer. The average annual temperature in Taloqan is 15.4 °C (59.7 °F). About 434 mm (17.09 in) of precipitation falls annually. ^ "Tāloqān". World Gazetteer. Archived from the original on 2013-01-05. Retrieved 2007-12-19. ^ "The Journey of Benedict Goës from Agra to Cathay" - Henry Yule's translation of the relevant chapters of De Christiana expeditione apud Sinas, with detailed notes and an introduction. In: Yule (translator and editor), Sir Henry (1866). Cathay and the way thither: being a collection of medieval notices of China. Issue 37 of Works issued by the Hakluyt Society. Printed for the Hakluyt society. pp. 558–559. ^ Hadis Al-Mahdiyul Muntazar:"Good for Al Talakan! Surely, for Allah in it are treasures, not of gold or silver but men who know Allah through truthful knowledge and they will support Al Mahdi at the end of Time." ^ "Climate: Taloqan". Climate-Data.org. Retrieved November 2, 2018.